FIND #1: Effective, individualized push notifications drive engagement and retention. Learn about the onboarding techniques and new technology successful brands are using to increase push opt-in and retention rates in 2017. During 2016, the mobile app space reached a tipping point. Since it was no longer possible to ignore the imminent mobile takeover, many brands rushed into the mobile app space without giving much thought to strategy or execution. They opted for broadcast messaging that toed the line of spam rather than tapping into the vast amount of user data at their fingertips to tailor messaging to the user. As a result, we were faced with the mobile engagement crisis. As the year continued, we saw a clear divide between apps trying to engage users through personalization and those that weren’t. Apps that provided personalization were industry leaders and saw higher retention and conversion rates. Those who didn’t burned through valuable users and faced public backlash in the form of negative App Store reviews. As we look towards 2017, this notion of personalization will no longer be optional. Gone are the days where a brand knowing information about you is viewed as invasive. In fact, consumers expect brands to know them; their preferences, their interests, even their location so that they can have interactions that are catered to them. In addition, consumers expect interactions with a brand to transcend channels and create an omni-channel experience. The data in this report is meant to serve as a roadmap for your 2017 app marketing strategy, while keeping in mind the consumer’s preference for a personalized omni-channel experience. Let’s reflect on the past year to ensure we continue our recovery from the mobile engagement crisis, and prepare for our journey into a 1:1 app marketing world. This is great news for mobile marketers, as retention continues to be a major issue for apps. It means push notifications have passed the reliability test and are now viewed as a permanent fixture in any successful app marketing strategy. But what makes a user want to open a push notification? When it’s individualized to the end user. An individualized message moves beyond just knowing a user’s name; it takes into account their actions within the app (and possibly on other channels) as well as if they fit into a particular audience based on their profile attributes. So if you’re not seeing push pay off for you, it’s time to go back to the drawing board and optimize your strategy to ensure it accounts for user behavior and profile attributes. As we move into 2017, this notion of individualized messaging will become even more important for app user engagement and retention. While we found new and creative ways to combat app churn in 2016, it’s clear from the data that we still have a long way to go. Part of this is due to the fact that these new individualization tactics have not yet been widely adopted by app marketers. But a larger part is due to the fact that many apps haven’t put enough emphasis on their mobile engagement strategy. Losing 80% of your app users is pretty scary stuff. Especially when you think of all the money you spend trying to acquire them. Once they’ve churned, it’s very difficult to get them re-engaged. But the fact that apps are losing more users should come as little surprise to those of us in the app marketing world, as a small percentage of apps continues to dominate a majority of the time spent in apps. Media apps are the clear frontrunner in terms of app retention, with 40% of their users returning to the app after one month. So what can other app verticals learn from this? That the shift towards mobile-first content consumption has forced media and entertainment apps to put a strong emphasis on ensuring their app functionality and experience is captivating, and as a result, they performed better than other verticals. If there is a silver lining amidst the mobile engagement crisis, it’s that some apps have led the charge towards improving the app user experience, and as a result we’re seeing a slight uptick in retention. During 2016, we saw the number of users who returned to an app 11 or more times increase 4% from 2015 to 38%. Clearly, the emphasis iOS devices put on the user experience is having an impact. From allowing notifications in chronological order to multitasking and split screen, Apple has prioritized improvements to the way that users interact with apps on their devices. As we move into 2017, it will be interesting to see the impact iOS 10 has on retention. Why the lift for medium sized apps? Most likely, this is due to a stronger emphasis on user engagement. While smaller apps are still figuring out their strategy and larger apps have made it to the big league, mid-sized apps are primed for growth. If you think about where mid-sized apps are in their lifecycle, they have broken through the App Store clutter and have established themselves enough to not only survive, but prosper. Now their main focus is on strong user engagement and that comes from effective app marketing (onboarding, push notifications, in-app messaging, remarketing, etc.) to help them continue to expand their base and grow into a large app. This is the moment mobile marketers everywhere have been waiting for. While rich push has been available on Android devices for quite some time now, the wait to reach the highly engaged Apple device users with compelling media is finally over. Rich push for iOS10 is important for many reasons. For starters, iOS users have been viewed as more valuable ever since Forbes published an article with data suggesting they were seven times more engaged than their Android counterparts. While more recent research suggests that this engagement gap is closing between the two, the fact of the matter is, it’s still there. Rich push now being available on all mobile devices speaks volumes to how significant mobile apps have become. Just a few short years ago, push notifications were viewed as annoying. Now? They’re beneficial and to some, even essential. From breaking news to reminders and even traffic alerts, push notifications help us stay on top of our day. Rich push notifications will do an even better job at this, providing users with more detailed information and allowing them to take action outside of the app. But with great power comes great responsibility, and it’s essential that mobile marketers get rich push right. This means tapping into user data to ensure every push it highly relevant to the end user, and following best practices (I go into detail about these in Takeaway 5). Now, the true test on what we’ve learned about mobile engagement over the past year comes to a head. Data is only useful if it’s actionable. So now that you have all of the necessary insights, about mobile app users, where do you go from here? Read on to discover five key takeaways that you can start incorporating into your mobile marketing strategy today. We’ve touched on user segmentation a lot in this eBook, and that’s because it’s one of the most important app marketing optimization strategies to implement in 2017. And while the notion of app user segmentation isn’t new (in fact, we’ve been talking about it since 2012), the influx of data readily available to mobile marketers is. Thanks to an increased popularity of apps combined with advancements in mobile technology (think geofencing and omni-channel), we now have the ability to truly tailor our messaging to the end user. Recognize the power of user profiles. Having users fill out a few key tidbits of information about themselves during the app onboarding process and on an ongoing basis is the foundation for effective app messaging segmentation. A sports app needs to know a user’s favorite team just as a music app needs to know a user’s favorite genre. Location matters. Knowing where someone lives means being able to send them messages based on relevant hometown happenings. Sending a “Happy Boxing Day” to users in San Francisco would not only be seen as irrelevant and spammy, but may leave users scratching their heads. Base messaging off their moves. Mobile marketers, you don’t always make the first move. Instead, try waiting for the user to take action within your app and then engage with them based off of that action. Don’t forget about the app user lifecycle. Basing your messaging to users off of where they are in their app user lifecycle helps provide context. For example, it’s poor form to ask a user to rate your app right out of the gate, but this message would be relevant to someone who has engaged with you 10+ times over the course of the month. Interested in learning more about user segmentation? Check out our blog post. Marketers are always looking to optimize their strategies. We A/B test everything from email subject lines to landing pages, so why wouldn’t we also A/B test our app messaging? 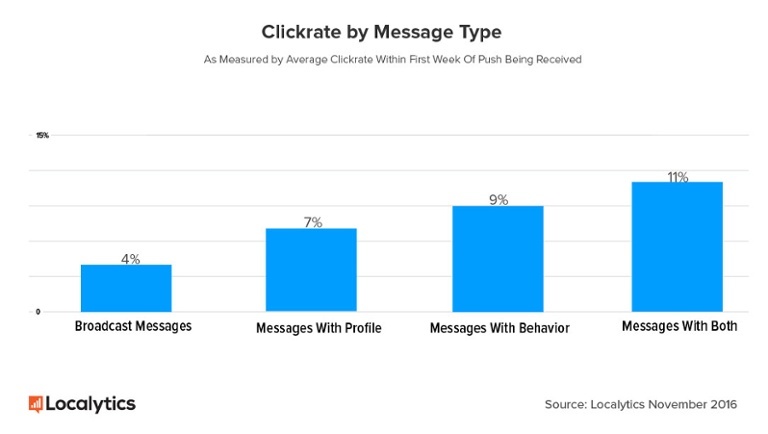 Click-through rates are a vanity metric. They’re not telling the whole story. Think about how many push notifications you get throughout the day. It’s possible that a user reads your message, but didn’t have time to click-through. Bad messaging isn’t the only thing driving your app users away. A bad app interaction can also cause users to abandon your app. But being so close to the product, it’s often hard to identify where user pain points are or where users are getting tripped up. Improving app retention will come from not only creating a more individualized user experience, but a better app in general. A picture is worth 1000 words. In a sea of media-rich push notifications, your text-heavy push will drown. Plus? Your app will appear old school and out of touch with new technology. Our prediction is that we will see app engagement increase in a big way for those apps who utilize rich push and do it right. What does right look like in terms of a rich push? Want to learn more about how to do rich push right? Check out our blog. Apps are meant to simplify life and rich push takes this ability to the next level by allowing users to complete tasks from their home screen. Expect big things from rich push in 2017. It’s changing the very way we engage with apps; and that’s ok. Innovation is a good thing. This shouldn’t come as much of a surprise since we have ourselves to thank for this shift in consumer expectation towards a personalized brand experience. After all, with the invention of apps came the ability to demand this level of personalization. Apps have completely disrupted the world; and their respected industries. From Uber, to Stitch Fix, to RunKeeper, and Spotify; successful apps have proven their weight in gold and it’s all thanks to the individualized experience they provide. Because let’s face it, nobody likes being a face in the crowd. So if you’re looking to be successful in 2017; it’s time to optimize your strategy to ensure individualization is at the core of everything you do.